Performance enhancing: Many athletes use performance enhancing drugs to do better in sports. Record improved: Many students saw that their behavior record improved when they started to behave better. Competitive sports: Americans love watching competitive sports because they are inherently competitive. Average body: The average body weight for a 5 foot female is 105 pounds. Ultra-endurance: Ultra-endurance sports force humans to work their hardest for as long as possible. Specialized bodies: Tall people have specialized bodies for the sport of basketball. Financial incentives: Many athletes take steroids because performing better provides financial incentives. Athletic performance: Athletic performance varies between people and is based on body type and experience. Energy efficient: It is most energy efficient to eat protein and carbs before playing sports. Changing genes: Over time, changing genes in humans has caused athletes to perform better. Different mindset: We have a different mindset today about global warming than we did twenty years ago. Tearing tendons: Athletes must be careful when lifting weights because tearing tendons is a serious concern. Human health: Taking drugs and drinking alcohol is not good for human health. Controversial issue: Global warming is a controversial issue in today’s political world. 1. What does David say contributes to the increase in performance in athletes abilities over time? 2. How have genetics and technology affected athlete’s performance? 3. What is the difference in athletes’ mindsets between today and in the past? 4. How do the accomplishments of runners Jesse Owens and Usain Bolt differ? 5. Are ultra-endurance sports harmful to our health? Explain. Performance enhancing drugs are a _____________ _____ in the sports world today. While some people believe these drugs can increase ________ ___________, it is obvious that these drugs are detrimental to _____ ______. These drugs cause athletes to have unfair benefits over others as well. Firstly, supplements to increase athletic performance should not be allowed because they can cause significant harm to the human body. For example, athletes who take these supplements may overwork their bodies and end up _______ _______ in the process. While professional athletes take these supplements because of _________ __________ in order to perform better, they are not ______ _________ to the body. Most athletes end up crashing after taking these drugs. Therefore, these performance drugs should be banned from all markets. Secondly, supplements should be banned because they provide an unfair advantage. In the world of __________ ______, an unfair advantage can result in money loss and defamation for the losing athlete. These drugs help athletes create ___________ ______ for the sport in question. Athletes on drugs have _____ _________ capabilities unlike the athlete with the drug-free and _______ ____. This causes the competition to lose its value and the real athletic talent to be lost. These drugs get rid of the real meaning of sports. In conclusion, performance enhancing drugs and supplements should not be allowed in competitive sports due to unfair advantages, and they should not be allowed in any marketplace, because they are unhealthy. Click here the full sample essay without gaps. 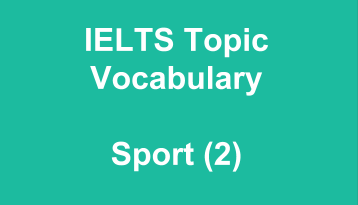 Click here for sample task two questions about sport.